1. Mild-steel structure, U shape beams by modules. 2. Sandblasting before powder coated. 3. 5mm thick checker top plate platform . 4. With OIML approved shear beam load cells. 5. With Stainless steel junction box, and 5m cable. Printing of ticket header and footer, with date and time on ticket or adhesive label (optional). Shipping notice to you as soon as your order is shipped. NOVO(Xiamen) Co., Ltd., is a well-known enterprise that specializing in the research and development, production, sales of electronic weighing scales and weighing accessories and provide weighing system solutions. Our company is located in the beautiful "Sea Garden City" – Xiamen,China.Our products export in Southeast Asia, the Middle East, Europe, Africa and South America and many other countries and regions. We have more than 20 years of manufacturing experience. 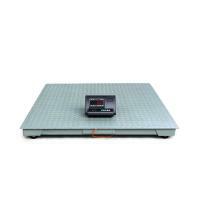 As a ISO9001 certified company, our products follow strict quality standards and management, ranging from mechanical scales to modern electronic price computing scales, weighing scales, counting scales,platform/bench scales, weighing indicators, floor scales,balance scales, crane scales, pallet scales,load cells,thermal printers and so on. We uphold the "professional dedication, quality first, users first" corporate culture and faith, the best of our ability to meet all your weighing needs. We are willing to mutual learning &mutual benefit with global partners! 1.Can you provide the sample to check? Yes,we can,the smaple time is 1-5 days. 2.Can you put our logo on the products? Yes,we can do OEM and ODM orders. 3.What payment term can you accept? Normally it's 30% in advance,70% upon receipt of B/L copy. After good cooperation,we can discuss better payment term.